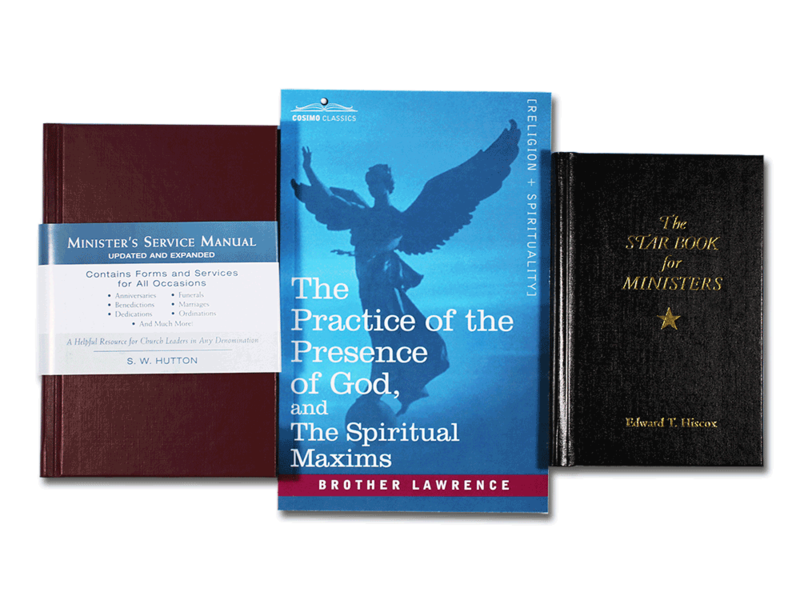 Save money by ordering these useful ministry starter books in a bundle: Minister Service Manual, Star Book For Minister's, and the Practice of the Presence. Minister Service Manual The very popular essential for all ministers, this guide has a basic overview of the most commonly performed ministerial duties such as baptism, funerals, blessings, and weddings. Make a great resource for Christian ministers. The Star Book For Ministers All time best selling book by Judson Press is another wonderful source of information for ministerial basics. It gives a great pocket sized resource to carry to all of your special events. The Practice of the Presence of God This book contains two collections of Brother Lawrence's thoughts, works of devotion, and his humble observation of nature. Brother Lawrence aka French mystic Nicholas Herman was a former soldier and converted at the age of eighteen to begin his powerful love of God.